A Christian Devotional: Happy vs. Joy -- What's the difference? I don’t think this is the way God intended us to live. And if we’re bent on huddling under the same black cloud as Lauren, I think we need to find out what’s really keeping us there. Letting our feelings be controlled by our circumstances can put us on a gut wrenching roller coaster. If good things happen, we’re up and if bad things happen we’re down. If really good things happen, we’re way, way up and if really bad things happen we’re way, way down. Nauseated yet? I know I am. And the thing is, we’re not the only ones affected by our mood swings. Our family members, friends and coworkers are impacted too. Although the words “joy” and “happy” are often thought to mean the same things, I’ve always understood that “joy” delves deeper into the human spirit. “I recently heard a great explanation of the difference between happiness and joy. "Happiness is dependent on outward circumstances. Joy, on the other hand, is internal and constant. Job had every reason to be happy. He was wealthy, had a fine family and as far as we know enjoyed good health. But, if you’ve read the book, you know that in just a short period of time, all of that was stripped from him. Bad things happened, really bad things that took everything he had going for him away. In just one day, Job lost his livestock and all his children were killed. Later, he was inflicted with great physical suffering. The Bible tells us that as Job sat among the ashes scraping his skin because of his painful sores, his wife told him to “Curse God and die”(Job 2:9b)! Now I know that Job wasn’t happy anymore. How could he be? Most of the good things in his life were suddenly gone. But still Job chose not to curse God or even die. Now it might be a stretch here, but I believe that Job may have had some joy left – an “internal constant” that remained. Because he says this about God: “Though he slay me, yet will I hope in him;” (Job 13:15a). 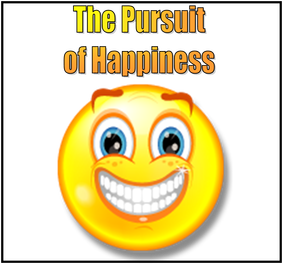 Are you in “the pursuit of happiness today”? I understand that, and I know that God cares about the things we care about. But we need to be careful not to serve the false “god of happy” as my pastor says, but trust instead that the “joy in the Lord” will keep you surefooted. No matter what happens today. kinds, because you know that the testing of your faith produces perseverance.